It’s important to bath your cat or dog when he is dirty. Giving your pet’s coat a good wash helps to keep his skin clean and free of parasites. But in general, you want to only bathe your dog or cat as often as is necessary, lest you strip your pet’s coat of its natural oils. For dogs, this depends on the type of canine you own. In general, dogs with longer coats that get grimy easily should be washed more than once a month while short haired dogs can be washed once a month or less. Ask your vet for a professional opinion on your specific breed. Indoor cats generally don’t need baths often as they groom themselves throughout the day. However, there are several situations that may call for a bath, such as during shedding season or if you cat is older and cannot clean herself as well as she once could. Also, those that are allergic to cats may want to bathe their cat slightly more frequently in order to minimize the dander. In general, if your cat’s coat has become matted and smelly, it’s an indication to start running the bathtub. While cats and small dogs can be washed in the sink, larger animals should be placed either outside in a plastic tub or in an indoor bathtub. For dogs, bath time requires training like anything else. The trick is to tie bathing to a positive memory and experience, similar to brushing your dog’s teeth. 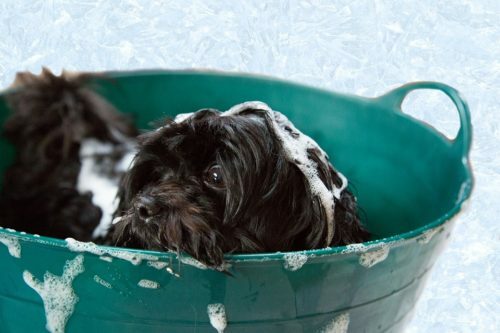 You can start by getting your dog in the habit of spending time in the tub. This may mean putting toys in the tub and giving him a treat when he enters. If you do this often enough, he will happily enter the tub without needing to be rewarded. Slowly work your way up to adding warm (not hot!) water into the tub. Cats are a bit harder to coerce into the bath as they are notorious for shying away from water. It’s best to try the same approach, putting toys in the sink and then slowly adding water and allowing the cat to play with the floating toys. Eventually you may need to place her inside, as she probably won’t go in willingly. TIP: If you are going to clip their nails, do it before the bath so they don’t scratch themselves in the process. Brush your dog or cat’s hair before they get into the tub. If possible, try to put cotton balls in your cat or dogs ears prior to starting the bath. It’s important to avoid getting water inside their ears. Then work from the neck down, shampooing your pet’s coat with a shampoo suggested by your vet. Avoid shampooing your pet’s face, instead use a warm washcloth and wipe around the eyes, mouth and nose. When you have given him a good scrub, begin to rinse and continue until the water coming off your pet’s coat is clear. Have a towel ready so that you can swaddle your cat post-bath or begin rubbing down your dog’s coat. While many people enjoy using dog blow dryers, be careful to avoid burning your dog’s skin. For cats, a household blow dryer will do if you put it on the lowest heat setting. Finally, use a wide toothed comb to brush your cat’s hair. For dogs, be prepared for a slight spray when he shakes his coat out.